Congratulations to Diana Hendry! Winner of the mother's ring. We had great success with our Mother's Day give-away, with many entries! Thornton's would like to thank everyone who entered into the raffle, and also those who showed interest and took a look around our store. 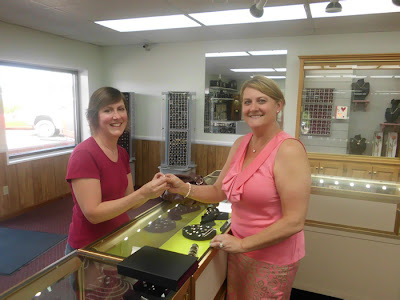 It's still not too late, however, to have a Mother's ring built for your special mom. We have a large selection of mounts ranging from two stone settings to fourteen! Thornton's Jewelry also has mother and child rings and pendants, and a wide variety of charms and bracelets for Mother's Day! Stop by, and let's see what Thornton's can do for you.